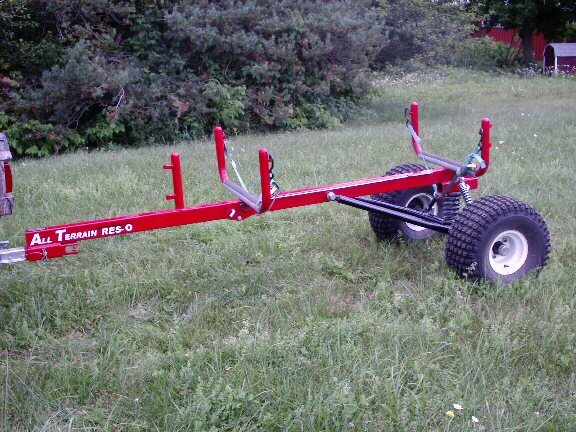 The All Terrain Res-Q™ trailers features a fully welded chassis made from durable rectangular tubing and schedule 40 pipe with a suspension system consisting of hydraulic assist shocks and coil spring. 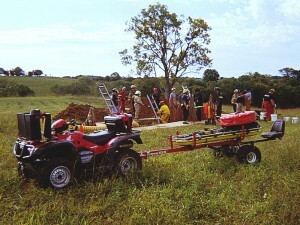 The unit is towable behind a ATV via the dual hitch configuration. 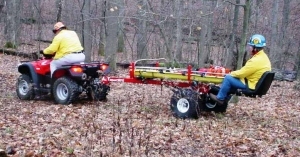 If the ATV does not have a 1-7/8 or 2 inch ball, you just slide the hitch out, reverse it and you can attach via standard draw pin style. Standard features are: Dual Hitch System, 22 x 10 x 8 ATV Tires, Stainless Steel IV Pole, Standard Hubs on Axle, Dual Ratchet Style Straps for attaching stokes litters, 750# cap. coil spring, hydraulic assist shocks and rear stand for storage. The All Terrain Res-Q was designed with safety in mind, not only for those who are doing the rescuing but for those who are injured. On the carrier portion of the ATR we have fitted it with rubber covers where the stokes litter rests to act as a anti-skid area along with being a insulator if you should need to shock a patient in cardiac arrest. Adjustable shock settings allow for a firmer ride or a more cushioning ride when trail conditions require it. Contrasting color straps also add to the safety factors of the ATR so you will visually see if the straps are secured correctly. The All Terrain Res-Q II model was designed for those with limited storage space. The ATR-2 trailers has all the same features as the ATR-1 but with the added feature of the front folding frame section for ease of storing the trailer. 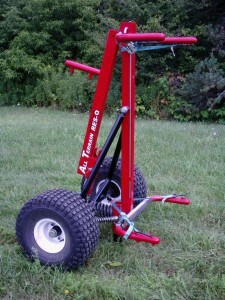 The ATR-2 is shown here where the front portion of the frame will split. 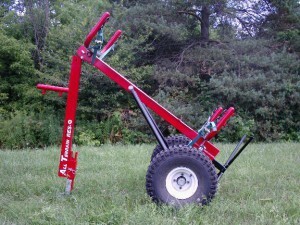 This will allow you to store the ATR trailer more conveniently with your ATV or snowmobile. The unit will split when you remove the 5/8 inch locking pin and fold under the main frame of the unit. Here you will see the unit resting on it own stand with the front portion of the frame tucked neatly under the rest of the frame. 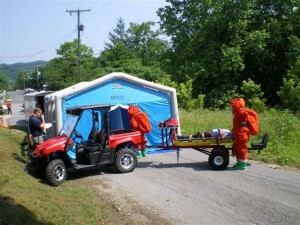 Both of our trailers feature the same durable construction and all the options will work with either the ATR-1 or the ATR-2.